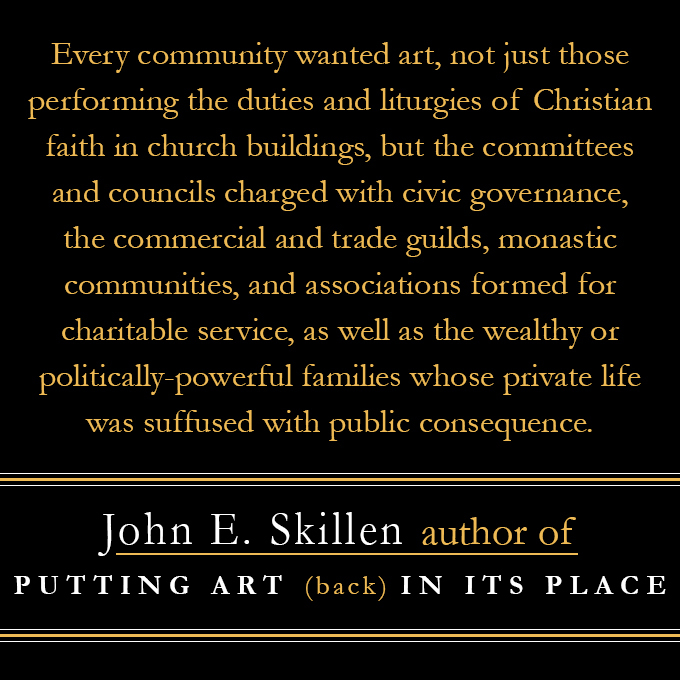 The below essay written by John Skillen (author of Putting Art (Back) in Its Place) was originally published in the Christians in the Visual Arts (CIVA) quarterly magazine SEEN, issue XVI:2. It was included as a “counterpoint” on the topic of art collecting. This essay offers a sort of counterpoint to the main theme of this issue of CIVA SEEN, namely, the role of the collector and collections in promoting the importance of visual art for contemporary people of Christian faith. Let me be clear: I am all for collecting, both by individuals and institutions! Indeed, we need more collectors whose Christian faith is integrated with astute aesthetic sensibilities, and who use their collections for the enrichment and edification of others. And as long as artists hope to make a living through sales of their work to people who enjoy “collecting art,” then we need a lot more collectors who purchase the work of the trained and gifted artists in our midst. I simply wish to remind us that the very notion of “collecting” is a relatively recent phenomenon. Collectors operate in a “system” of conventions and assumptions that have marked the conditions of artmaking and art-viewing only during the past couple of centuries. These conditions assume the autonomy of the artist, whose artworks are generally the result of private choices made independently by the artist working alone in his or her studio, seldom operating with any knowledge of where the painting or sculpture might end up, who would see it, who might buy it and for what reasons. The collectors who buy art are free to do with it as they wish, displaying it above the sofa or treating it as an element of their investment portfolio. Curators such as those in the not-for-profit galleries found in many of CIVA’s institutional members serve the purpose of getting the artist known and her work appreciated by a larger circle of people, some of whom may become purchasers and collectors. Okay; but I would underline that these conventions of production, sales, and display serve to isolate the artwork from any mutually-answerable relationship between the artist and a community that appreciates its need for the artwork. 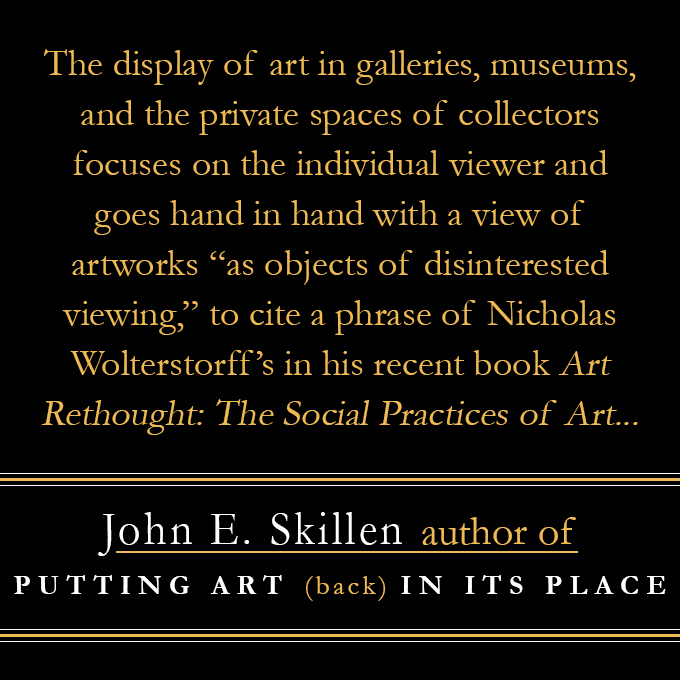 The display of art in galleries, museums, and the private spaces of collectors focuses on the individual viewer and goes hand in hand with a view of artworks “as objects of disinterested viewing,” to cite a phrase of Nicholas Wolterstorff’s in his recent book Art Rethought: The Social Practices of Art (especially parts 1 and 2). For a much longer premodern period of (Western) history, the conditions of the production and use of art included reliable relationships (not always conflict-free) among four parties. Initiating the ‘quadrangle’ of these four constituencies were the communities who valued how art “worked” to give shape and direction to the activities that marked their identity and mission, and to the particular places that housed their work. The patrons commissioned and funded the artworks; and scholarly advisors were called in to help the hired artists understand the themes and concepts for which the artist was entrusted to give sophisticated visual form. And every community wanted art, not just those performing the duties and liturgies of Christian faith in church buildings, but the committees and councils charged with civic governance, the commercial and trade guilds, monastic communities, and associations formed for charitable service, as well as the wealthy or politically-powerful families whose private life was suffused with public consequence. I am becoming of the opinion that this older model, revised for the conditions of our own time (such as the fact of pluralism and the end of any sort of Christendom), would better serve communities of faith by putting art back in places where – more than as an object of aesthetic gazing – it can do the work of instructing, reminding, and inspiring the community to pursue its calling. One step would be to move the “collector” in the direction of active engagement earlier in the process of the production of art, serving more in the pre-modern role of commissioner and patron rather than coming along late in the game as the buyer and display-er of finished works of art created out of any context. In the meantime, I applaud the guest editor of this issue of SEEN, and a central figure central in the history of CIVA – long-time president Sandra Bowden – for taking steps in that direction by making available the Bowden family’s remarkable collection of sacred art for wider use by communities. 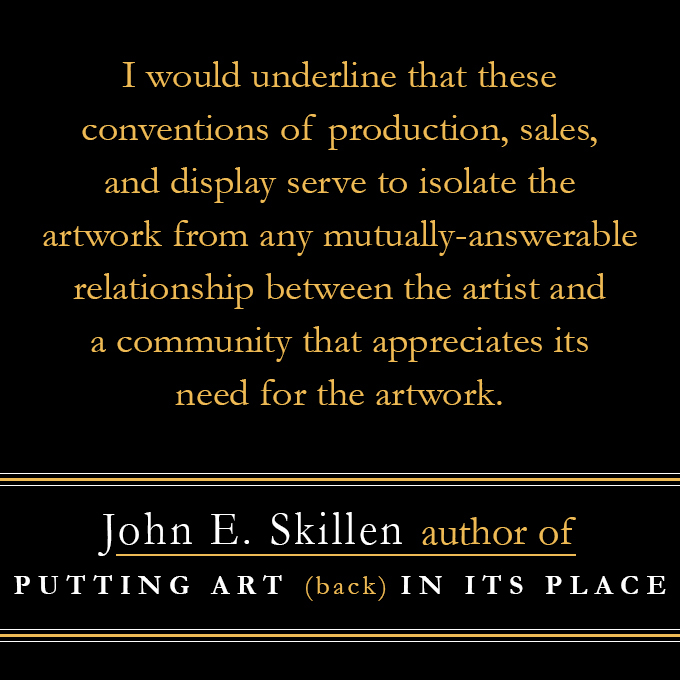 For more information about Putting Art (Back) in Its Place, feel free to check out this review, read this Q&A with Skillen, or visit our website!